--It doesn't matter how you do it and how unorthodox it may look. It just matters that you win which is what the Saskatchewan Roughriders did Thursday night, beat the Tiger-Cats 31-20 in Hamilton. You can complain about Chris Jones all you want and criticize every move he makes, but at the end of the day his football team is 3-2. Yes, if it weren't for a brain-cramp against Montreal they would be 4-1. How are they at this point? They are trudging along with the back-up quarterback who is showing signs of getting better, but still looks uncomfortable. They are doing it with their best player in the wrong position and they are doing it. They are finding a way. The buttons being pushed by Jones are producing victories. Its as unorthodox as you know what and you may not like it, but the bottom line is they are 3-2. 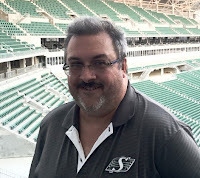 --The hue and cry of Rider Nation could be heard loudly as the Riders plodded their way through an uninspiring first half. The offence couldn't do much and while the defence was doing its best to keep their team in the game, it looked like Hamilton would earn a split of the home-and-home as they went into the room at the half. Then it was BOOM!! The team that couldn't or didn't want to run the football started the 2nd half with an 80 yard Marcus Thigpen touchdown run, the dormant Jerome Messam got in the game and plowed his way to 70 yards on 12 carries. Tre Mason busted one for 30 on a 3rd and 2. Hitch screens and shovel passes which had some frantically cursing or typing away at their keyboards were silent when Jordan Williams-Lambert took a shovel pass for 17 yards with Bridge then sucking the defence in on a go pattern as he found a widdddddddde open Naaman Roosevelt for a 32 yard score. As TSN's Glen Suitor so aptly put it, the Riders baited Hamilton by continuing with the little hitch and dump passes knowing Hamilton would bite which they did. When the green-and-white got their chance, they capitalized. --As Chris Jones said a couple of weeks ago, he doesn't care what the fans think when it comes to his decisions. He doesn't care what anyone thinks. He just gets results. Results he has gotten at every CFL stop he has made. The bottom line is Jones and crew are getting it done much to your enjoyment or your chagrin. Is Jones above the criticism? No he's not as is any coach, but you are measured by wins and losses and at the end of the day this team is 3-2. Not bad! --Farewell Fantuz! The announcement Thursday of Andy Fantuz's retirement didn't really shock anyone I think. What a career he had! There haven't been many better Canadian receivers in my time watching the CFL. His hands were special and his TD catch in the 2007 Grey Cup forever endeared him to Rider Nation. Plaza? Hall of Fame? Absolutely! How can you not have him in both! --The Terrell Owens/Edmonton Eskimos story is bizarre and is now over. Did the Eskimos think a 44 year old man who hasn't played football in years would help them? Did they think someone will give them something of substance to get T-O's rights? Will another team want to bring T-O in? Please don't for the good of the league. --The Kawhi Leonard-Demar DeRozan trade is still one that leaves me scratching my head. If Leonard can sign long-term with the Raptors, I think it is a win for them, but there is no indication at this time to think Leonard's time in "The Six" will be for more than one year when he bolts in free agency. As PTI's Mike Wilbon said, it comes down to the Raptors asking themselves can they get more in one year with Leonard than they could for three years with DeRozan. Management thought yes so the deal was made. We'll see. --Speaking of DeRozan, I guess Gatorade has to re-do its one commercial featuring him. It's been a pet peeve of mine for years, but why doesn't corporate Canada embrace CFL players, Gatorade can't use Mike Reilly, Bo Levi Mitchell, Duron Carter or someone else? No company that advertises with the CFL can find a player for an ad campaign? It is somewhat astounding! --Speaking on the Dan Patrick show this week, MLB Commissioner Rob Manfred was talking expansion. Montreal's name came up which didn't surprise me, but Manfred then said "maybe someplace else in Canada". ?????? Is he talking about Vancouver? The Seattle Mariners would love them as a close rival, but they would hate Blue Jays fans staying away from SAFECO Field, Winnipeg has a great park where the Goldeyes play, but that park would have to have a lot done to it to make it major-league standards. The only other place would be Calgary. Calgary certainly has the corporate to make it work. Would this be what is needed to get the Stampeders a new stadium? I've never heard Manfred say another Canadian centre besides Montreal. At the end of the day, I have to think he is talking about Vancouver, but who knows. Calgary for an MLB team? Sign me up for yearly visits, especially if the team is a National League one that would see a visit each year from the Cubs. --We go into the weekend at the Open Championship and while some big names like Dustin Johnson and Sergio Garcia are out, many are right there. Rory McIlroy is two back, Jordan Spieth and Rickie Fowler are three back and Jason Day, Tiger Woods and Phil Mickleson are six back. It is going to be a great weekend of early-morning golf. Sign me up! --I never ever thought I would say this, but perhaps it is time we just scrapped the national anthem before sporting events. Sadly, it has become too big of a hassle. Just remove it from the equation and let's move on for the betterment of all. When it comes to international play, play it at the end for the winning nation as done at the Olympics. --That's all I got Enjoy the weekend! Scruffy; that 3-2 record that you're so proud of? That's all Eastern opponents, the next six games are against Western teams. Let's talk record then.